Tonight, I used up the leftover pizza from Friday. I sauteed a vegan Field Roast Grain Meat Company apple-sage artisanal sausage; I started with a clove of garlic, finely diced, in olive oil over medium heat, and about 30 seconds later added about 1/5 of a medium yellow onion, diced maybe to 1/4". About a minute later, I added the finely chopped sausage link. After about five minutes when the sausage was gently browning, I added some broccoli, cut into small pieces, as well as a tablespoonful or so of pine nuts. I was careful to cook for just a half minute or minute, just so the nuts barely started browning and the broccoli turned bright green. I put some fresh caponata sauce atop the pizza then spread the sausage mixture. 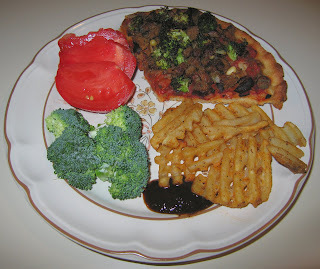 I also popped some waffle fries into the oven, and served them with Frontera brand chipotle hot sauce. It was a good recreation of this earlier meal! This past weekend, my wife found a vendor at the farmer's market who was selling dhokla, a tasty steamed chickpea or lentil flour Gujarati delicacy. I warmed the two pieces that she had left, as well as small samosas that she had brought home from her party on Saturday. 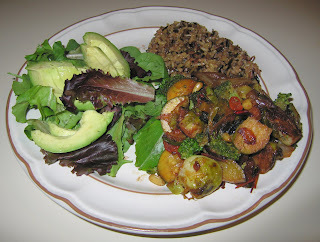 I was out much of the day, but my wife put together for her lunch a black-eyed pea curry. She had sprouted organic black-eyed peas and added them to a little bit of sesame oil, mustard seeds, turmeric, asafotedia, and dried red chili peppers. She told me that she also added some water (I'm guessing a quarter cup or so after a brief saute of the spices over medium heat) and cooked, covered, over low heat for about 8 minutes, then served with some salt and homemade garam masala. There was a little bit of the peas left, and I included them with our dinner. I had purchased a wild mushroom salad (that included sundried tomatoes and olive oil) from Whole Foods Market, and topped mixed salad greens with it. 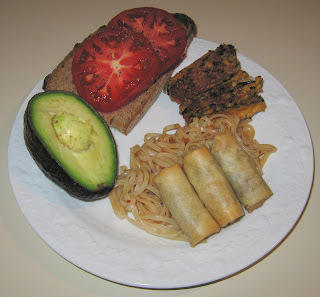 Half of an avocado rounded out this tasty meal! I look forward each year to the Carrboro Music Festival; this year, yesterday, there were around 200 bands from 1p till past 11p in many venues, and, as always, all for free. We enjoyed very nice jazz, world fusion, a cool "psychetronic dub and soul" band called Blue Marble Beat, Japanese rock, and more music. We took a break to enjoy a nice meal at Panzanella where we got what we always do - a pasta dish for my wife, shared salad, and so yummy pesto (they have been stocking two vegan pestos, a standard basil one and one with broccolini; like last time, I chose the unique broccolini) pizza for me with artichoke hearts, mushrooms, and a little bit of onion. I was off to another film, Shine a Light, a Rolling Stones concert film by Martin Scorsese (and, alas, the last of the art museum's outdoor summer films for this year) tonight, and my wife was going to a dinner party. Like yesterday, I was running late; I drove an hour to Greensboro, NC to cover a rally by Barack Obama and Joseph Biden (so sad - I was 15 minutes late and could not then get into the press coverage area!) and spent some time visiting a few outlet stores on my way home. I made a simple dinner for myself. 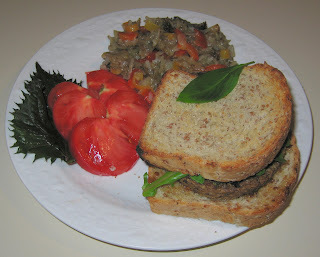 I heated a prepared Amy's California Veggie Burger and served it on some lovely, sour "Le Miche" farm bread with an olive tapenade and mustard spread. I also prepared some Potatoes O'Brien and corn-off-the-cob. I was running late today; originally, we were to eat out as I was scheduled to teach a photography workshop that ended at 7p and the film Control about Joy Division's Ian Curtis was playing at 7:30p. My wife was going to get some South Indian food that we would have eaten at the outdoor film. However, the weather was threatening rain. I postponed the workshop and ended up at the auto mechanic's shop with some brake repairs. My wife decided not to go to the film, so I had to quickly put food on the table and get to the film myself. 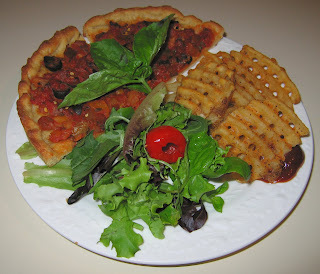 I picked up some frozen Vicolo Pizza organic cornmeal crust pizza shells and made a tasty pizza simply by spreading some caponata sauce on top and baking. I also picked up some frozen waffle fries, and baked them, as well. It was a good dinner! We were surprisingly low with groceries as I've just not been out shopping for a number of days. 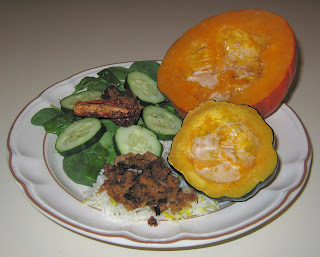 My wife had purchased a large light green squash she knows as lokhi, or bottle gourd, Italian edible gourd, or Italian squash, at our farmer's market recently, and I used that as a base of a saute with various herbs, including jerk seasoning. I also served some Himalayan Red Rice that I cooked with a vegan bouilloun cube, and served some chickpeas that my wife had soaked and sprouted. Dinner was good, but what surprised me is my wife's comment. She loved the squash and said it was much better than she ever remembered her making it when she lived alone and did some cooking. For tonight's dinner, I started two or three small cloves of garlic, thickly sliced, sauteeing in olive oil for just a minute or so, then I added two vegan Field Roast Grain Meat Company's apple-sage artisanal sausage that I had sliced into approximately 3/4" pieces. Maybe a minute later, I added a third of a medium red onion that I had sliced into half moons, as well as some hot orange peppers. I started some thick rice noodles boiling for just a few minutes till they were cooked, then I drained and washed in cool water. 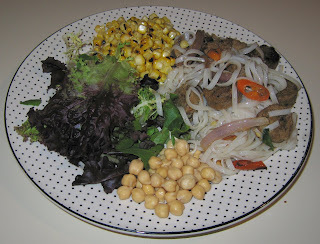 I added a few Vietnamese herbs to the saute for just a minute or so, added some salt, and then mixed into the noodles. It came out well! I also flame-roasted two ears of corn, mixing in some Earth Balance margarine and salt. It was a good dinner! We had a friend who came over to discuss something with us, and we suggested that she join us for dinner, which she did. 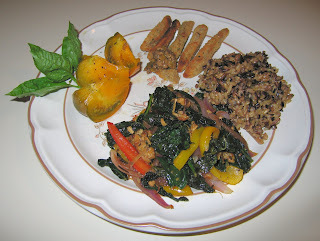 I prepared a simple kale and tempeh saute, as well as a new product I found in a convention grocery store clearly marked "vegan", Macabee Kosher Foods' eggplant sticks. The eggplant sticks were easy - they just needed to be heated for about ten minutes in the toaster oven. 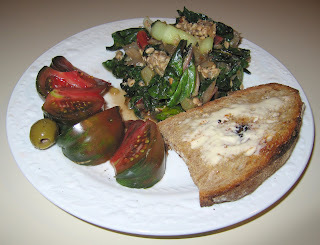 The kale I've sometimes prepared blanched and sometime sauteed; today I went with the latter. I sauteed most of an organic red onion that I had sliced into thin half moons, as well as about a third of a package of tempeh, cut maybe 1/2" x 1/4" x 1/4". 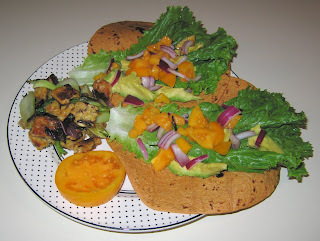 As the tempeh started browning, I added some chopped ginger and lime juice and slices of orange and yellow bell pepper, as well as leaves of kale that I had hand-torn into maybe 2" squares from the stems (I tossed the stems into the compost bucket). A few minutes later, I added maybe two teaspoons of tamari sauce (soy sauce would be fine) and about 1/4 teaspoon each of tarragon and fresh oregano leaves, as well as a teaspoon or so of fresh rosemary needles. I think dinner came out well. I'm glad to see this new eggplant product, even clearly marked vegan! Yesterday, we were out and about and my wife started feeling quite hungry. We stopped at Maggiano's Little Italy, a nice chain restaurant that has a good variety of vegan options (though not marked on the menu). The chef came out and indicated that all of their dry pastas were pure semolina wheat (and water and salt, probably) with no egg or dairy products. He said that their marinara sauce was finished with I think some dairy, but he could make up a custom sauce for us based with fresh tomatoes or oil. We shared a very nice salad with a tasty dressing. I forgot how huge their servings were (the "half" salad was plenty), and our full serving of pasta was too much for us to eat, even sharing that one order. We ordered fettucine pasta with the chef's choice of a tomato-based sauce (he included broccoli and [too many!] olives). It was tasty and certainly filling! Tonight I made a fairly simple dinner. I made hashed brown potatoes with bell peppers and onions. 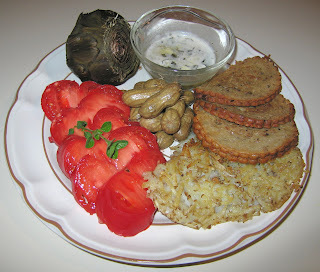 I occasionally make plain hashed brown potatoes for breakfast and like them crispy then. However, when I use my cast-iron pan, as I did today, the potatoes come out soft - still good, but different. When we were in Germany, we enjoyed Zwergenwiese brand vegan spreads, and brought back their Zwiebel Schmelz ("onion melt"). 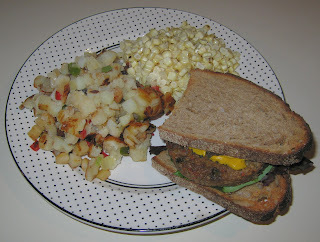 I prepared (just heated for a short while in very little oil) Amy's brand soy-free California Burger and served it, with the spread, on excellent whole grain bread that we usually get when we shop at the Carrboro Farmer's Market, as my wife did this morning. It may have been simple, but it was a tasty and filling meal! I am lucky in all the classes that I teach to meet so many nice people. In my cooking class, I have a woman in class of Vietnamese origin who grows many herbs, including a number of Vietnamese ones that she doesn't know the names (at least the English ones) of. Last night in class, she brought in quite a few of her herbs for me to try. I had the idea of soaking some rice noodles in very hot tap water for a few minutes till soft then rinsing in cold water and draining before using in a quick saute with the herbs. But I decided to be more substantive. I took a medium-large organic baking potato (unpeeled) and cut it into approximately 1" by 1/4" by 1/4" sticks and started the potato sauteeing over medium heat. After perhaps 6 minutes or so, I added most of a medium sweet onion sliced into half moons as well as most of a package of seitan. I had first prepared the seitan by cutting it into thin strips comparable to the potato and marinating for about ten minutes with some Baja Lime marinade and a few drops of Mongolian Fire Oil. 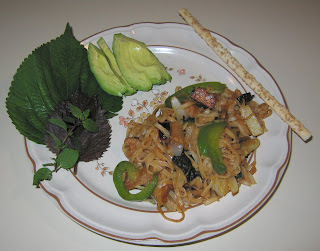 After about 5 more minutes as the seitan was starting to brown, I added some chopped ginger and maybe a third of a bell pepper cut coarsely, as well as the drained rice noodles. I stirred for a minute or so then served. We loved the noodles! Today, I received a review copy of a medical thriller, Capitol Reflections, that may be interesting especially to those who love good quality organic food. The author of the book, Jonathan Javitt, is a doctor and scientist who has been a senior White House health advisor for the last three U.S. Presidents. His story is of "Dr. Gwen Maulder, an FDA scientist hot on the trail of a conspiracy involving genetically engineered food that ends in death for too many innocent victims", as per the blurb. I have a very nice set of eight students for my cooking class. They seem to have figured out from the beginning how to work well together - tonight, they did a great job with an Italian dinner featuring an eggplant saute, orzo with lemon juice and pine nuts, bread salad (panzanella), polenta, and (not shown here), blueberry crisp for dessert. They put everything together in just an hour and a half or so of cooking, so we could eat at leisure and be out of the classroom earlier than usual. 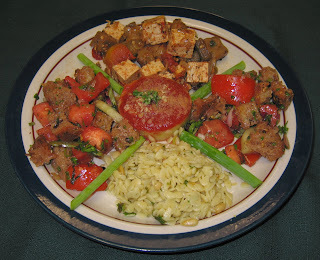 The dishes came out well, particularly their panzanella. We went out to exercise in the early evening and came home at close to 9p, hungry. I wanted to get something on the table quickly, so relied on a new frozen product, Blue Horizon Organic (oops, I found out from their website that they are primarily a seafood company ...) brand Indian-style organic spring rolls. They simply needed to be heated for 10-12 minutes in my toaster oven - and my wife and I both very much enjoyed them! 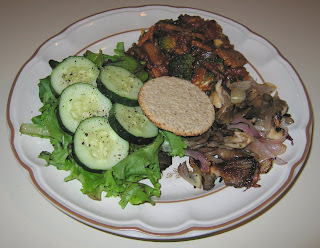 I also sauteed some tempeh and served it on the side. I boiled some wide rice noodles, drained, and mixed in a little soy sauce and garlic gold nuggets, and served the spring rolls over the noodles. It was a good and quick meal! I wasn't sure I would be cooking tonight as I started photography tutoring with a new student. But my wife had a business meeting all day and we both ended up at home around 7 or 7:30p and I put dinner together. I sauteed maybe a dozen Brussels sprouts, cut in half, along with half of a medium-sized yellow onion that I had cut into maybe 1/2" cubes. As the onion and Brussels sprouts started browning, I added a medium zucchini cut into 1/2" widths and then cut in half, as well as two different types of small hot peppers and cooked for 3 or 4 minutes, till the zucchini was softened. I added a handful of broccoli crowns, maybe a teaspoon of pine nuts, a pickled mild hot pepper, and a little bit of soy sauce, and cooked just a minute or so more, serving with salad and a brown and wild rice mix. A few days ago, I bought some prepared gazpacho soup from Trader Joe's. 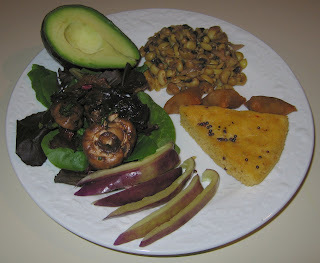 I thought that I would prepare a largely raw meal, including the soup, that included a spinach salad with cooked tempeh. I sauteed smoky tempeh that I had cut into maybe 1/2" squares and a coarsely chopped shallot. As the tempeh started browning, I added a little green bell pepper, cut into squares a little smaller than 1/2". 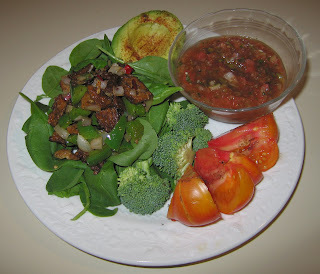 I continued sauteeing for another two minutes or so, then served, with salt, atop baby spinach greens. Unfortunately, the soup seemed to be opened. As we sat down to eat, I asked my wife if she had sampled it - she hadn't. So we didn't chance things - I'm going to return it to the store and get a fresh container. 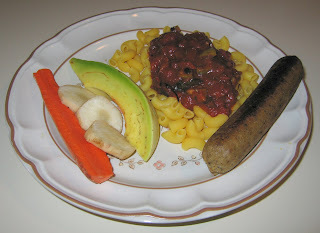 In its stead, I quickly heated a vegan apple-sage sausage by the Field Roast Grain Meat Company that we shared. I'll serve cold gazpacho soup soon! Yesterday, my wife and I came home from a lecture on an art exhibit and from some errands to find a message from my Mom that she had made homemade pizza. We went over and enjoyed her tasty pizza for dinner! On Saturday, we had my favorite potluck of the year in our vegetarian society, a joint event with the NC Society for Ethical Culture. Each year for about ten years now, I moderate a discussion with three panelists from our group and three from theirs, addressing the question "What do you think are the two or three most important ethical issues of our time and what, as individuals, can or should we do about these issues?". I'll post a link to the podcast soon. Anyway, I was anxious to share that great Turtle Mountain "Purely Decadent" coconut milk-based ice cream that I just found at Whole Foods on Thursday. I brought a pint of each flavor - chocolate, cookie dough, and mint chip (I see on their website that even more flavors are available!!). They are all great - rich, tasty, creamy, and just a hint of coconut taste. The cookie dough is probably my favorite with mint chip a close second, and even my third choice, the chocolate, is delicious! That was my contribution to the potluck; there was a good variety of other dishes that folks had brought. Tonight was the first of six Thursday nights (we're actually off one Thursday, I think October 9th) for the vegan cooking class that I teach. I used to teach this class more often but now for the last few years "focus" on photography classes (pun intended!) more; the photography classes seem to always fill up early on (the next 6-week photography class starts in late October and is already full). One reason I love to teach is that I get great students - and this class is certainly no exception! I often get one or two vegetarians in the class, but this class (of eight) seems to have several vegetarians and vegans. This picture is the cooking of my students - today was mostly lecture, discussing some background about vegetarianism, and getting to know each other; working in two teams, they had about 45m to put together this dish named after what one can do to quickly put together a tasty and nutritious meal when a friend shows up to visit at 3 in the morning (this has happened to me a number of times!) 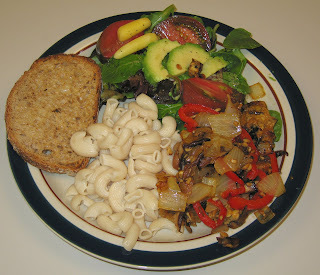 It is a saute of tempeh, shiitake mushrooms, and onions, served over pasta (we used brown rice pasta today) with salad and bread/toast. They did a great job putting together a tasty dinner possibly in record time. For this first class, I bring a variety of frozen desserts as we just don't have time to make dessert. Dessert! I have great news about that. I have been predicting for some time that coconut milk will more commonly be available as a base for "ice cream" (I also predict that we will be seeing more hemp-based products - I can't wait to find a hemp cheese!). When my wife and I were in California back in May, we found in Bolinas' People's Store coop a fabulous coconut milk-based ice cream, Coconut Bliss. I sure wish we could get it here, as well. I think it was just yesterday that a friend in Ohio mentioned that she saw not Coconut Bliss, but another coconut milk-based dessert, and a coconut milk-based yogurt. I found them both at the Whole Foods store in Chapel Hill, NC when I was shopping for class today!! Turtle Island has a tasty Purely Decadent brand of soy ice cream; soy sometimes bothers my stomach, but I can't resist occasionally treating myself to one of the Purely Decadent "ice cream"s.
They had a new line of non-soy coconut milk-based ice creams!! They had three flavors; I bought one with cookie dough - wow, it was great! All the students and I loved it - it is so creamy and rich. I think most if not all felt that it couldn't be distinguished from great ice cream. I didn't buy it, but did see that Turtle Island also has coconut milk yogurts!! I can't wait to try them. I wasn't planning on making dinner tonight; I had a nice provided dinner of pasta, pizza, and salad at a meeting that I attended to distribute grants to community organizations, and my wife was either going to stop on her drive home from her out-of-town meeting to get something to eat, or enjoy leftovers. However, she wanted me to make something quick and hot for her, so when I got home, I did. I had made hashed brown potatoes for breakfast and left some for her. I reheated it, as well as the Field Roast Grain Meat Company's Celebration Roast, which I had served on Sunday. I was surprised that she had forgotten about a steamed artichoke that I had prepared in late August; I reheated it, and made a fresh dipping sauce out of Earth Balance margarine, fresh lime juice, salt, pepper, and fresh herbs from my garden, and some dried basil. Finally, when we were recently at the beach, she had purchased some boiled peanuts, and I heated some that were left and served them. Yesterday, we went with a group of friends to see a very nice outdoor puppet show. We had a picnic, to which I contributed a Florida avocado salad (along with two or three kinds of heirloom tomatoes, onion, rosemary, and lime juice) and sandwiches made from Field Roast Grain Meat Company's Celebration Roast, which I simply sliced and served cold. I was happy to see that The Raleigh News and Observer published my article yesterday. I think it turned out pretty well, though I was a little taken aback by the poor grammar with which I was quoted. When I saw an actual copy of the paper, I was surprised to see my picture taking up about half the height of the newspaper page! I hope that the article helps people to see how easy it is to eat delicious plant-based foods. Welcome to new readers of my blog who found it through the article! I don't generally like things that look like meat; I'm a vegetarian (vegan!) and easily find a tremendous diversity of good food choices. I don't at all have a problem with other people enjoying meat analogues, but they generally just don't look appetizing to me. One of the few exceptions is a fully vegan wheat-based artisanal apple-sage sausage by the Field Roast Grain Meat Company. We love their products and buy them on their own merits, in spite of their looking like meat; they are readily available at Whole Foods Market and area coops. Their Celebration Roast is also delicious, as are all of their products we've had - and they're all very easy to prepare. I didn't have much time to put dinner together tonight as we had spent significant time at Common Ground (a very nice new green building center - we're using their non-toxic paints, and they came up with a near exact match for the white trim in my house) and I was then running late for a film at the state art museum. I had some multigrain pasta elbows waiting to be prepared and some Seeds of Change brand Porcini Mushroom di Apennine sauce. I started the sauce simmering, adding some fresh basil and oregano, as well as chopped olives. I also took these vegan sausages and, with very little oil over medium heat in a cast iron pan, cooked them for a few minutes. As part of the salad, I served a Florida avocado. I had never purchased Jerusalem artichokes(also called sunchokes) before a few days ago, and understand that they can be eaten cooked or raw. I tried slicing them raw - they were crispy and watery, reminding me of water chestnuts. I'm not sure if I will have a blog entry tomorrow; we are going with friends to see the Paperhand Puppet Intervention theatre performance I am an Insect. We may each put together some picnic items and eat at the outdoor show. I had some thin Filet Beans (also known as Haricot Verts) from my visit to the farmer's market last weekend (ever since my return from Europe, I've been keeping an early schedule; I was at the market as I recall around 8a! 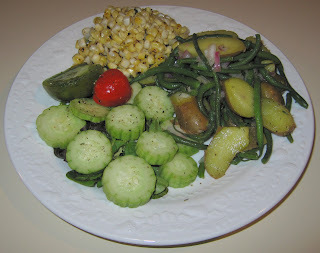 ), and some small fingerling potatoes from the all-organic produce section of Tidal Creek Coop. I cut the potatoes into diagonal halves and boiled them for about eight minutes or so till a fork could just pierce them with gentle pressure, then added the beans (first cutting a bit off of both ends). I cooked for just about two more minutes till the beans were done, then drained the pan and mixed in a little bit of salt, black pepper, and dill, as well as a few teaspoons of Earth Balance margarine and a small organic shallot. It was a very good dish! Also at the farmer's market last weekend, I found the Armenian cucumber. Also known as a snake melon or snake cucumber, it is nicely crisp with soft seeds, and is supposed to be one of the best slicing cucumbers. I sliced the cucumber that I bought and served it - it was indeed good. I also grilled three ears of white and yellow organic corn on the gas range's open flame and served it, stripped, with a little hot pepper, salt, Earth Balance margarine, and some fresh lime juice. Yesterday was the last (of four 2-hour sessions) class of my new Lightroom class. A student joined my wife and me to eat at Tallula's, a Turkish restaurant. We need to eat here more often - we loved the food! I remember their warmed hummus - indeed, that was excellent (some of the best hummus I've had), as was the rest of their mixed vegan appetizers and two main course plates we shared with everything from baby eggplants to a baby okra stew. Tonight, I baked two squashes from the local farmer's market, an acorn and one I had never had before called a sunshine squash. I simply preheated the oven to 375°F, halved and seeded the squashes, and baked them for about a half hour, cut edge down, in a shallow plate of water. They were good - the sunshine squash was a bit sweet. I heated leftover vegan sausage scramble that I had from when I recently made lettuce wraps, and served it atop leftover Basmati rice from Sage Vegetarian Restaurant from last Thursday. It was a good dinner! Yesterday, Tuesday, I served at the first of two meetings on a committee for the Weaver Street Market Cooperative to award grants from their Cooperative Community Fund. One reason that I love shopping at coops is that they are not just about being viable, profitable businesses, but they generally have as part of their missions giving back to the community. For these two meetings, Weaver Street Market is kind enough to provide dinner - I had tasty pasta, pizza, and salad from their sister restaurant, Panzanella. On Monday night, we had a very late lunch at Tidal Creek Coop's very good salad bar (including excellent smoothies - I had such a good hemp milk and almond butter smoothie on Saturday here!) that we ended up finishing around 5p. Other than a light snack when we came home, that ended up being our dinner.